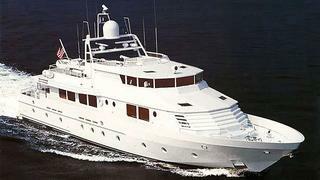 Tucker Fallon at Bradford Marine Yacht Sales tells me that he's brought the 31.7m motor yacht Silent Wings to the market. Built by Derecktor in 1990 to a design by Diana Yacht Design Silent Wings is MCA compliant. An interior in fine English walnut accommodates six guests in three staterooms including a full beam master suite and twin 1500hp MTU engines give her a cruising speed of 9 knots. Lying in Florida, Silent Wings is asking $1,395,000.